Former Massachusetts Gov. 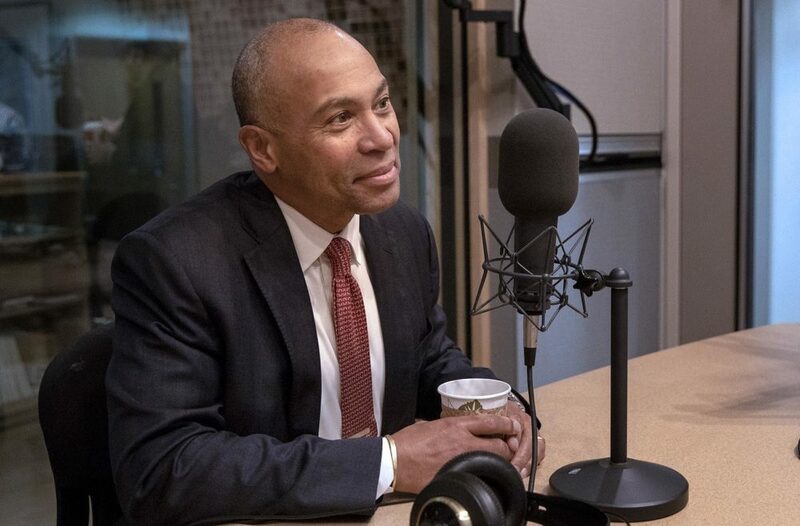 Deval Patrick confirmed Thursday he won't run for president in 2020, telling WBUR in an interview that his decision was due in part to the cruelty of the process. "As [my wife] Diane and I reflected on it, there's no way around the fact that the process is cruel," he told Bob Oakes. "And though she and I were prepared for that, I think we realized that it was going to draw in and affect people we loved who were not necessarily prepared for that or signed up for that." He revealed during the interview that this thought process came into sharp focus after Diane was diagnosed with Stage 1 uterine cancer just a few weeks ago. She had surgery before Thanksgiving and is expected to make a full recovery, he said. "It's the sort of thing that focuses the mind," Patrick said. The Democrat served two terms as governor. After leaving office in 2015, he joined Boston-based Bain Capital. Patrick doesn't have the national profile of some other potential presidential candidates, including Massachusetts U.S. Sen. Elizabeth Warren, who has said she'll take "a hard look" at a run. In the interview, Patrick called upon his fellow Democrats to offer a positive alternative to President Trump and the Republicans. "Our party has to offer a positive alternative — in other words, more than just a perfected critique of the current administration," he said. "As angry as we have a right to be, as concerned, frankly, as we all ought to be of the state of democracy, I think what makes a difference is that we have a positive alternative agenda and a positive alternative vision to offer the American people." Patrick campaigned for Democratic candidates before last month's midterm elections, and said he "chose on purpose places that were off the beaten path," where Democrats hadn't been competitive for a long time and where the candidates were committed to campaigning at the grassroots. He emphasized how important it is for candidates to show up and listen, pointing to Lauren Underwood, a 31-year-old registered nurse and a black woman in an Illinois district that is mostly white. "She won because she engaged with people. ... She didn't run from being a Democrat or being a progressive," he said. "Her point was, 'I am your neighbor. And I am here as a servant-leader, and I want to offer that servant-leadership to this community.' "
In the upcoming campaign, Patrick said he hopes to hear new visions and new messages to voters. "I want to offer the very, very best of what our party is about. I want it to be about seeing the unseen and hearing the unheard," he said. "We are continually reducing people to a cartoon of some kind of voter demographic and not seeing them for the complex individuals they are with the range of needs they have. They're not looking for government to help them solve every problem in their lives — they're just looking for government to help them help themselves." He demurred when asked if this is the end of his career in politics, saying there are many ways he can help without being a candidate. He said he's at peace with his decision. And he also wants to focus on his day job, overseeing a fund investing in socially responsible companies. "If I can't, in this cycle, make change in government," he said, "I can make change in capitalism, and there's a lot of change there that needs to be made."